When I first heard the theme of ‘Maps’ for this year’s Guild of Enamellers’ conference, I wasn’t sure it was for me! Maps and I do not have a happy relationship. All this squiggly lines that jiggle when I am anxious or stressed! Default emotions for me when I come to use one it has to be said. How my husband and I have stayed together when driving anywhere is a total mystery. Actually it isn’t because I used to drive whilst he navigated. I have only let him drive us places since Sat Navs came into being! These ideas have evolved during many sleepless nighttime design sessions. My best ideas come at about 3am! My recent jewellery has increasingly come to contain memories and emotions; hopes and dreams. These new pieces have continued to develop this theme. Jewellery with meaning in celebration or remembrance, to inspire and define you. Brighton is a very special place to my family and I. 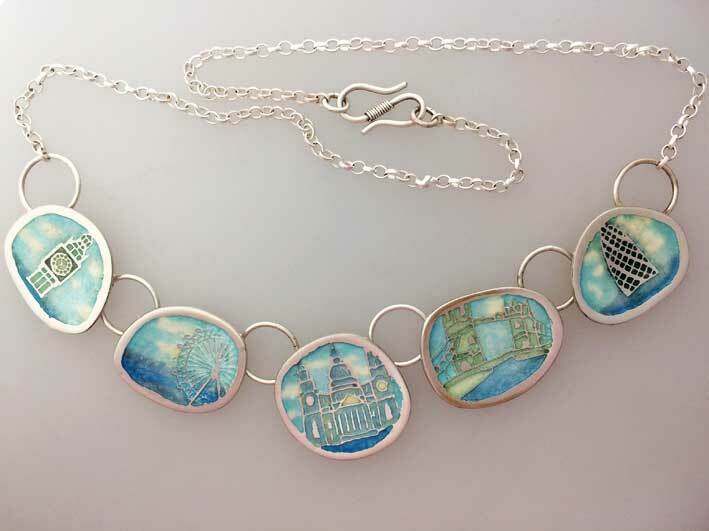 This Map of Memories necklace recalls many visits over the years, parking in Madeira Drive, walking along by the Wheel, up to the Brighton Pavilion in its green park, (one of my favourite places in the world,) and then back down to the sea to walk on the pier. I often seem to have been blessed with beautiful sunshine and a blue sky, even in winter so my Map of Memories Necklace symbolises the very best of days out in Brighton. 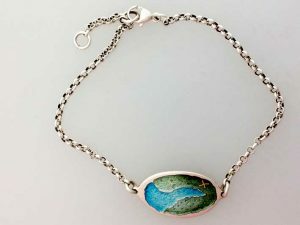 Champleve enamel on silver. SOJE604,101,238 and BJG V23. All other colours are shaded with one over the other. The colours have been left pale to recall misty wintery days on the Thames. 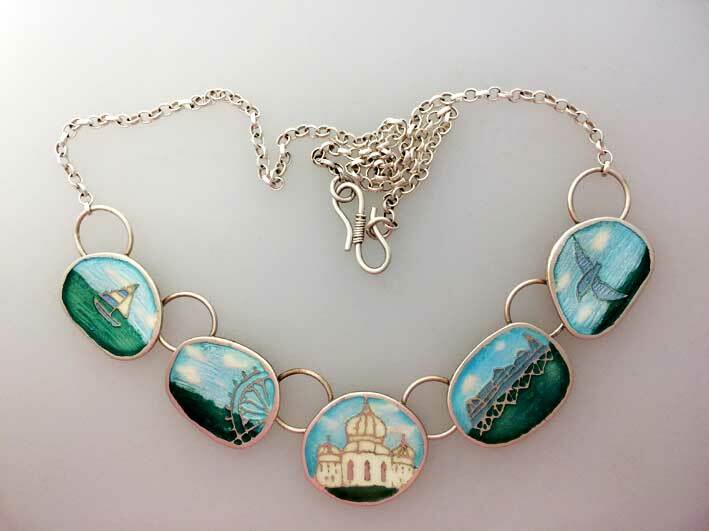 This Map of Memories necklace holds memories of many visits to London and trips down the river. Here we have embarked at Embankment and we travel down the river past Big Ben, the London Eye, St Paul’s cathedral, Tower Bridge and then the Gherkin Building. The edges of both these necklaces are irregular because memory is never perfect and the silver is shaped like pebbles to hold the fragments of special memories. I like the idea of a piece of jewellery holding memories of people and places. This is a map of the Northern Ireland coastline. A gold X marks where Belfast is. My son Kieran is at University here and I like to wear this bracelet and think of him. 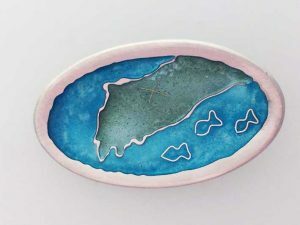 A map of the Italian coastline. A gold X marks Sorrento. This is a place which holds lots of happy memories for my family and I. The concave shape holds the memory as a secret, thus it appears decorative with only selected people understanding the meaning.